Full Price: $ 30.00 17% off! 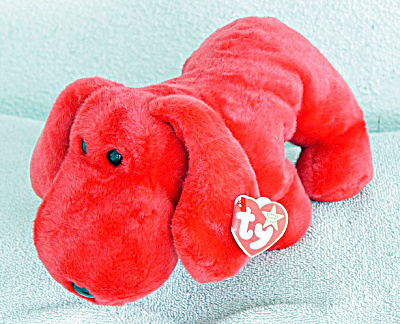 Ty, Inc. Rover the Red Dog Beanie Buddy Plush was introduced on September 30, 1998 and retired on December 12, 1998. According to this beanie buddy's tag, Rover the smaller Beanie Baby was the first non-breed dog that was introduced in the summer of 1996, when his tag said that his red color set him apart from the other dogs. This is the larger companion beanie buddy that is about 9 inches tall by 12 inches long. This bright red dog has black bead-like eyes and a black nose. He is mint with tag old stock, and has not been exposed to smoke or unpleasant odors. Expand listing to view all 3 photographs.